In the early years of the decade, online multiplayer social games were in fashion. Many sites were made, providing an opportunity for children, teenagers and adults to freely communicate with each other through the given interface. Penguins, bears and rabbits, various other animals and tiny human-like figurines became known as ‘avatars’ and were available for personalization by the users. This is a whole virtual world, where your avatar lives the life you would like. You can do many of the real life’s activities there, but the main reason people go to this site is to meet other avatars (people) in this virtual environment. Welcome to the private universe of Habbo ( www.habbo.com ), formerly known as Habbo Hotel. The online enterprise was started up in 1999 as a small hobby-project called Mobiles Disco by Finnish designer Sampo Karjalainen and his friend Aapo Kyrola. Within just a year, though, the project developed into something much bigger – Hotel Kultakala (Hotel Goldfish) which would soon transform into what we all know as Habbo. Dee Edwards, an investor from Great Britain, hired Karjalainen to make a unique platform with graphics interface – a portal that was to become internationally successful. This project was financed with venture capital, collected from various sources. In 2001, the beta version of Habbo Hotel is launched from the headquarter located in London, UK and just a few weeks after the launch, the final version was released. After the UK release 31 others followed. Starting from Switzerland and the four languages there, continuing to Italy, Sweden and the United States, Habbo Hotel was taking over the world. See also: Godaddy.com - Domain, E-mail, or Hosting? This success, though, went too far and began getting out of control. In 2006 the Chinese branch of the website was to be canceled due to the fact that it was financially unreasonable to keep it. After this, the Chinese nation was reluctant to use the other-language portals. At the same time, the HabboHotel.com website was transferred to a new domain – Habbo.com. All the other extensions followed too, making Habbo.co.uk instead of Habbohotel.co.uk and so on. The exception of the Chinese lands, though, brings other issues – less usability and popularity. In 2008 the problems continue with another shrinking of the media. 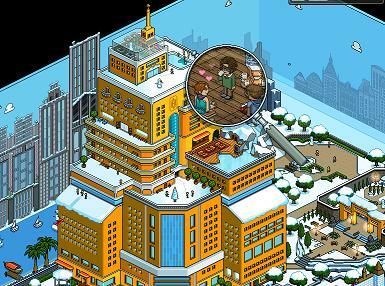 As a result of the low numbers of Russian citizens within the hotel, Habbo Russia also closed down. Following suit, in 2010, all English-language parts of the social network were merged, making Habbo.com the only one where people are able to speak through their avatars in English. All the problems, though, are just simple hurdles on the way to greatness, as Habbo continues to be used in over 150 countries and 230 million avatars are registered as of 2011. Every month the site is visited by more than 10 000 000 people from all around the globe. That many people can’t be wrong, can they? In addition to this, the unique monthly visitors have been constantly growing. Moreover, the special participation of celebrities such as Tokyo Hotel, Aril Lavigne and many more have brought a lot of attention to the project, even the attention of people who wouldn’t care about it, if it weren’t for their own favorite musician. Habbo is the ultimate graphical social network. Even though it has started up as a simple chat system, it is now a worldwide fun for every teenager or those who feel like one. Great graphics, multiple ways to entertain oneself and various other enjoyments such as avatar personalization and discussion boards are all incorporated into this decade-old service. Everyone has once had a Habbo account and most of us still keep it.